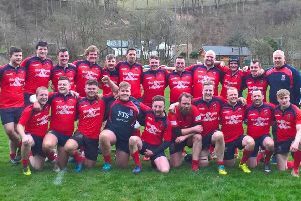 ABerdeen were physically too strong for Kelso in the National Cup semi-final at Poynder Park. However, league results elswewhere on the day meant Kelso preserved their League One status (picture by Gavin Horsburgh). A much-improved Aberdeen side had too much firepower for injury-beleaguered Kelso in the semi-final of the National Cup. The city team were just too physical and ran out winners by five tries to one. It was to Kelso’s great credit that they were still in the game at half time, despite conceding three tries. An early penalty by Craig Dods set the scoreboard running but the enormous pressure exerted by Aberdeen brought a try by Ben Inglis, after Kelso just ran out of tacklers. Bryn Perrott added the conversion and that try was followed 10 minutes later when, from the game’s first scrum, number eight Greg Ryan controlled the ball at the base of the scrum to plunge over. The conversion was missed. A clever kick and chase by Mark Wilson took the hosts into the danger zone and the visitors conceded another penalty, which Dods slotted. A penalty was awarded against Kelso at a defensive scrum and Ryan tapped and drove over while Kelso were still organising their defence. Perrott added the extra points. A break by Gregor Mein, followed up by Dods and captain Phil Hume, allowed Arran Jackson to make more ground. A Kelso penalty was stopped within the 10 metres and, with the referee playing an advantage, Dods kicked towards the left wing, where Jackson fielded and touched down. Dods converted from far out and Aberdeen centre Tom Aplin was yellow-carded. That made it 13-17 to Aberdeen at half time. A Perrott penalty after 10 minutes of the second half stretched the lead. Aplin and Dods both were unsuccessful with long-range penalties but a blistering move by the visitors’ backs allowed winger Craig Shepherd to swallow dive over at the posts to give Perrott an easy conversion and Aberdeen a 27-13 lead. Kelso had a period of pressure but to no avail and put up desperate defence for the rest of the game, but had Kris Mein yellow-carded and succumbed to a penalty try. Kelso: Arran Jackson; Mark Wilson; Gregor Mein; Craig Dods; Matt Kindness; Murray Hastie; Phil Hume; Gareth Clark; Blair Robertson; David Leitch; Alex Thompson; Cammy Brown; Kevin Dryden; Kevin Wilson; Kris Mein. Replacements: Craig Sweenie; Fergus Common; Greg Cessford; Andy Tait; Angus Roberts; Gregor Miller; Craig Bruce.